Learn to windsurf while making new friends! Do you want to have lots of fun? Do you like being part of a team? Then Spinout Windsurfing Camp is made JUST FOR YOU! Jump on a windsurf board and share the experience of your new skills day by day. After riding on the turquoise water, have some unforgettable adventures while discovering Kos island. 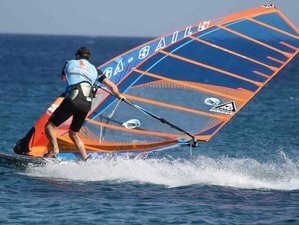 You will do the windsurfing on the beautiful Kardamaina beach on Kos island, Greece. Kardamena is a perfect location for windsurfing because of its flat waters and steady wind and you can have a long party every night. Please take notice the prices below increase during July and August due to high season.